Have you ever looked at a photo taken long ago and now see it from a completely different perspective? I know I have. For the most part, pictures don’t lie. There’s always something subtle (or not so subtle) that speaks of the real truth at the very moment the shot was taken. That’s the real beauty of photography for me and certainly something that I take to heart as I begin to finalize the placement of photos in the intro of the film. As you know I’ve been following your journey via your blog for some time (from my own blog http://life-begins.blogspot.com) and I’m greatly looking forward to seeing the finished film. I thought I would send you the attached pictures for your consideration for the intro, as I had been reflecting recently on my own father and my relationship with him. 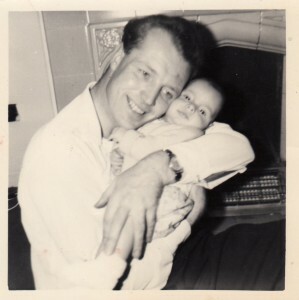 For reasons I won’t expand upon, I was probably never quite as close to my father as I would like to be to my own son. However he was a devoted father and did teach me a lot. Even today I find myself in admiration of his good qualities such as his warm, eloquent and, above all, polite manner in any social situation. In a world where our communication has become more terse and more easily corrupted by slang or worse, he still acts a reminder to me that it needn’t be that way. Now a father myself, I appreciate what he went through and what he gave me with a new perspective and gratitude. My father remains a more remote presence in my own children’s life than I would like, as now in his seventies he is making the most of opportunities to spend time in warmer climes which reduces the time we get to see him. But he does enjoy the kids company when we do see him and they have an affection for him that is disproportionate to the amount of contact they have with him and is all the more heart-warming for that. I guess there was really no need to give you all that background, but I thought that as a film-maker you might appreciate it. Best of luck with the remaining work on the film.